The changing face of Veganism paves the way for more plant-based products reaching everyone and every lifestyle. 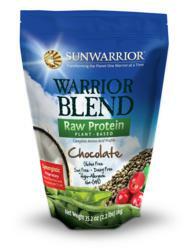 Sunwarrior announces the availability of Warrior Blend, a unique raw, plant-based protein, in Vitamin Shoppe. Our availability in Vitamin Shoppe is a huge step for us as a brand. It’s also a wonderful place to showcase our products. Plant-based products are a rising trend in the health food industry as more actors, musicians, athletes, and business moguls declare themselves vegan or vegetarian. The changing face and popularization of veganism has paved the way for these supplements to reach people of any lifestyle, not just vegans. Sunwarrior, a plant-based supplement company based in Southern Nevada, is pleased to announce their newest protein, Warrior Blend, is now available in Vitamin Shoppe online and in their over 500 retail locations. Warrior Blend fuses the power of several protein sources into a smooth, great tasting, and revolutionary proprietary formula that is overwhelmingly superior to the individual components alone. This dynamic fusion, along with a cold extraction process, creates a unique, raw, plant-based protein with a complete amino acid profile exceptionally high in Glutamine, Arginine, Lysine, Luecine, and branch chain amino acids. Available in chocolate and vanilla. Warrior Blend is free of solvents, GMOs, radiation, artificial flavors, artificial preservatives, or artificial colors and contains no animal products, dairy, egg, gluten, soy, added sugar, wheat, or yeast. For more information about Sunwarrior visit http://www.sunwarrior.com. For more information about Vitamin Shoppe visit http://www.vitaminshoppe.com.